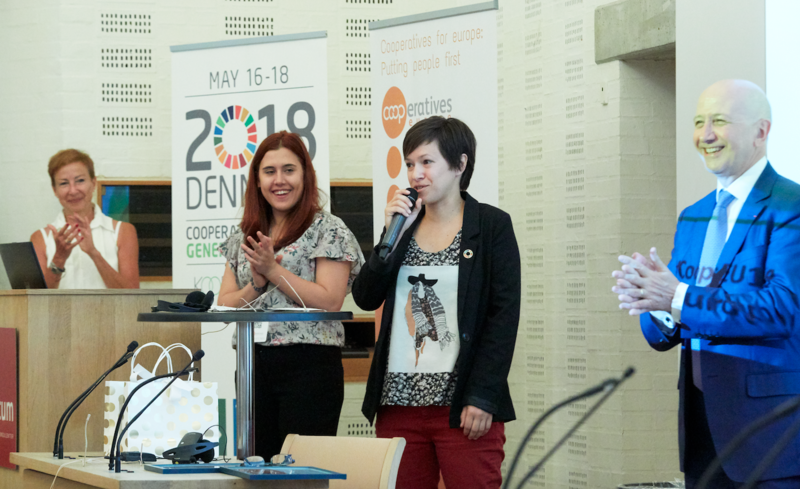 In the framework of Sustainable Development Goals (SDGs)– the chosen topic of 2018 Cooperatives Europe General Assembly – the 2018 #MyCoopStory competition sought out young people developing activities or contributing through their cooperative to the advancement of SDG 5 – Gender Equality. Following a Europe-wide search with the support of members, partners and the citizens, we were very impressed by the diversity and the quality of many of the projects submitted by young cooperators. The judges – member Kooperationen and Young European Cooperators Network (YECN), together with Cooperatives Europe, selected the top four projects who presented their cooperatives through a video round. The top two cooperators joined the 2018 Cooperatives Europe General Assembly and the YECN gathering in Denmark between 16-19 of May, where they presented in front of the members of CoopsEurope, participated to workshops on gender equality, joined the youth meetings, and networked at member-specific events. Watch the award ceremony and hear from the finalists here. BRLOG cooperative is the first female coop brewery in Croatia producing socially engaged beer breaking down gender stereotypes. Starting with a pot, a ladle and a laptop, they have grown with support gained through crowdfunding, and are now about to release their second beer called "Disobedient"
Women with Energy Coop or Mujeres con Energia Cooperativa is a group of women implicated in several projects related to energy transition in Spain. The group promotes the inclusion in a very masculinized energy sector and includes ecofeminism philosophy in all projects of the cooperative. WAZO is a cooperative made up of international network of creative economy collaborators willing to find real impact and business opportunities, working on a regular basis on gender equality. Pozytywka is a Polish social cooperative providing child-minding services to young mothers attending job interview and trainings to re-enter the labour market. The cooperative also hosts a kids cafe where traditional gender roles are mixed, teaching kids that boys and girls can do the same job! Thank you to the sponsors, the supporters and all the participants! Read about the 1st edition of MyCoopStory: Collaborative Economy, here.